Is this blue canvas wall art hand painted or printed? This canvas wall art Giclee artwork, Eco-ink resolution, abstract painting printed on water-proof canvas. Is this modern canvas painting come with frames or just canvas rolled? This canvas print is stretched on wooden frames, ready to hang on wall. Every art piece is checked carefully, including the art work, the package, we will ensure it is perfect for shipping. If you are not satisfied with our wall art, pls return it and we will refund you full payment after receiving the return painting or resend you new painting. Please note the display pictures are only for illustration purposes. They were not taken in real display rooms and do not represent the real size of the artwork set. They are just as an idea to help you being aware of how this canvas wall art looks like in a room. Overall size 60"W x 30"H (12x18in x2pcs, 12x24in x2pcs, 12x30in x1pc), Total 5 pcs / a set. High resolution canvas wall art, HD pictures photo printed on canvas with vivid color on high quality canvas. Modern Canvas painting Giclee artwork. Ready to hang on wall. 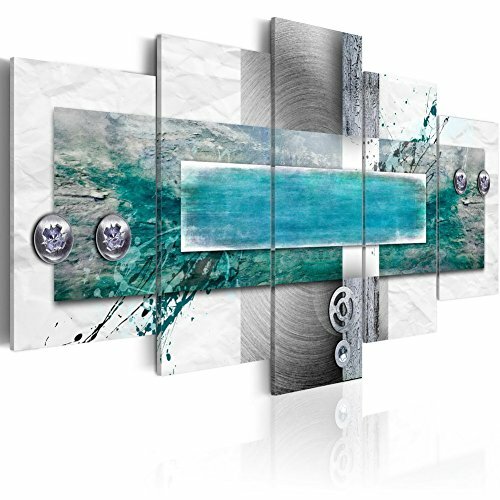 Blue abstract art is already perfectly stretched on strong wooden frame and metal hooks have been mounted on each panel, which easily to hang out of box. Good for living room, bedroom, kitchen, office, hotel, dining room, bathroom, bar etc. A great gift idea for your relatives and friends.